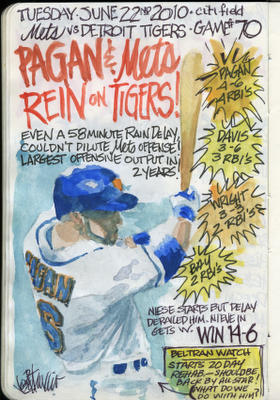 My Mets Journal: TIGER MAN! I correctly assumed that Pagan would be the game's subject. Though, I did also picture several Mets players, with bats in hand, chasing orange and black kittens around the pitchers mound :) I guess that might have bothered some animal right people though. I have to ask, was it hard to go back to a single page after the Yankees series? As always, just great work. Thanks. It's always tough when you're dealing with animals. You don't want to offend anyone. I actually like the single page, BUT...I will use the double page every now and then if I need to get my point across.